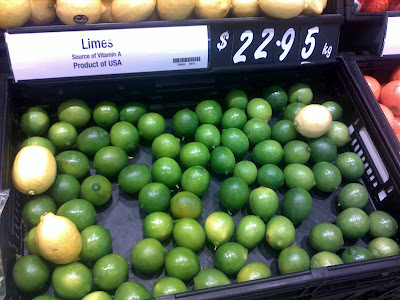 Labels: limes, why are limes so damn expensive? Just by looking at this picture and the mention of hinava, asam sdh sia rasa my ujung2 jaw...bihis mau keluar. Amahal nogi! Sedangkan yang selalu di sini pun bising2 suda sa membeli, apa lagi sana kan. Heheh.. Ah balik rumah ni saya mau petik la banyak2 limau. Tus buat hinava juga mehehe..
Manda - Ya. dekat2 sa pengsan tgk harga dia. Boring ba cni teda tamu. Tausalah wanna eat tropical fruits there mrs! You could buy the lime juice instead? Much much cheaper alternative. They sell those at the supermarkets kan? Stella - Sot ba harga dia sini ni. Papaya yg kici mcm belimbing pun mau $6.00. Nda manis lagi tu. Carol- OMG. Yaka???? I never thought of that! Will cari in the supermarket! Teacher, that's too expensive ('O')woahh!! why is it so expensive..?? oh my, yeah you should really plant the tree...for the sake of hinava! hehe..
Yabah.. they sell the lime/lemon juice in a cute little fake lime/lemon shape bottle.. normally they put with the real lemons.. i think.. hehe..
Aemy- The limes are mostly imported from the US but recently the prices increased by 15%. I have no idea why. Crazy oh. Ohhh!! That's too much! At least in Penrith they are only $7/kg. Tapi ginger ... makkk! $33+/kg. woaaaahhh! At a cutthroat price, those limes in pasar polipin kk seems to be the oasis for hinava making ingredients! Gunaqz- Wahh....terbalik oh. Here ginger is $7 per kg. Mahal jg di sana!!!! Ennie- Ya! mulau ba the price here.